I would offer up a rhyme. My plots and thoughts need more length. To the novel, this writer goes. 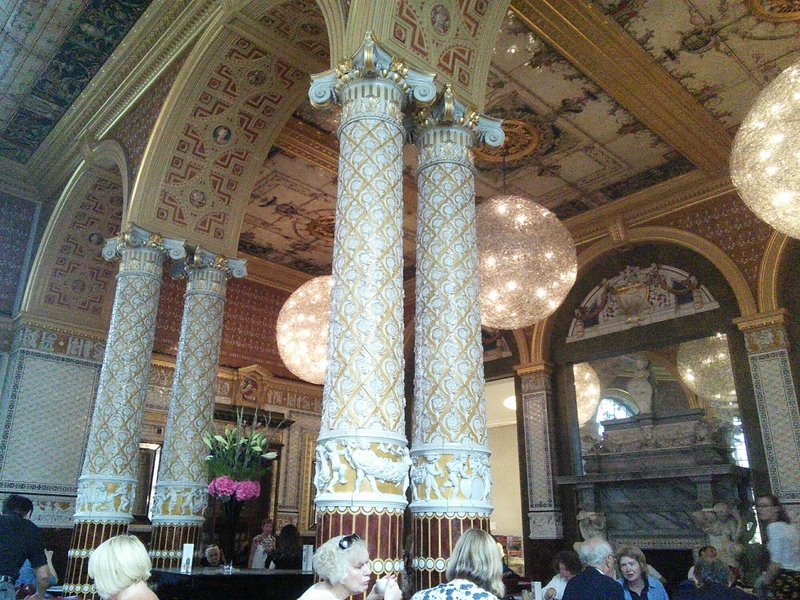 Last week I attended two exhibitions at the beautiful V&A museum in London. To refresh myself I took tea in the amazing cafe. What a joy this building is! My piece ‘Writing on the Move’ has been published on the Faber Academy website. New to the London Book Fair is an opportunity to pitch one’s novel to an agent or publisher in a dedicated one-to-one setting. An email advising that tickets would be available from 9am this morning arrived in my in-box yesterday and at the appointed hour I sat with my finger poised over the mouse. As the page became available with the list of appointments I began to click and watched horrified as they disappeared one by one in a blink of an eye. Finally I managed to nab some appointments for different agents and went to eat my granola feeling quite pleased. When I returned to my computer I was the recipient of an email to say that each applicant would only be allowed one meeting and all of my tickets would be re floated if I didn’t contact the main office. Fortunately I made the call just in the nick of time and still have my meeting set up. I felt like a naughty teenager caught out pinching something from the sweet counter in Woolworths but an opportunity to meet agents and publishers is like a Belgian chocolate – too good to eat just one. Last night I went to see my friend’s daughter, a talented singer songwriter, perform in a cellar bar near King’s Cross Station. As I stood there bouncing my head along to the music and tapping my foot to the beat, I was taken back in time to my youth. I was a guitar playing hippie chick who played and sang “songs with meaning” in the era of Bob Dylan and the like. I never went anywhere without my guitar. It accompanied me on my travels through Europe and comforted me when my emotions threatened to run away with me, usually because of the latest love interest. I tried to write songs however as I only ever played using a small selection of chords, I suspect they were never going to be considered great works. But, oh they were good days. Wasted of course, as is often the case, as the young are often unable to appreciate how wonderful the freedom of expression that accompanies youth can be. Last night brought it back. I suspect my young friend would have been surprised at the young me. But as is the case as our skin thins and our hearing deteriorates, we become invisible. So although she likes me, I know that she could not see herself in me. Don’t you love the talent of the young? Free in expression and with heightened emotion they can push boundaries with their talent. Do you know anyone who inspires you like that? By the way, has anyone seen the Damien Hirst exhibition at the Tate? Now that is pushing the boundaries!! !